So yesterday I was playing in my only PPTQ of the season. I technically could have played on Saturday and Sunday, but I thought it would just be a better story to spike the last tournament of the season. And what I mean by that is that instead I raided five Moltres (two shiny!) and played the new expansion of Betrayal at House on the Hill with my daughter. I guess “new” is stretching it for 2016, but new to us. We also had soup dumplings. Betrayal at House on the Hill is EFFING AWESOME and I highly recommend it. You can get it on this here site. Not an ad. An actual board game recommendation, lol. Anyway, my chances at spiking that one-and-done PPTQ were in dire jeopardy by round four. I had aced Humans per normal, died a horrendous death to a new As Foretold (combo? prison?) deck [see below], and then had another easy matchup against Scapeshift. But sitting down against my Round Four opponent, I was immediately worried. I had seen him play earlier and knew he was on Hollow One. Before the tournament started I scanned the room and saw a lot of Celestial Colonnades. So I did something nasty, cutting not only my Shattering Spree, but one of my four Sacred Cows of Chained to the Rocks.
. Their “good” draws are manageable in sideboard games because even though their guys are either huge or graveyard-resilient, none of them lives through a Chained to the Rocks. It’s the Spree that really hurts because it is one of the only ways to get out of a hyper-explosive multiple artifact draw. Luckily I won the roll and had a great opener. Two lands, a Goblin Guide, and multiple Searing Blazes. If he did nothing on the battlefield on his first turn, I could just play Eidolon of the Great Revel, and, between his cheap manipulation and my trusty Blazes, put a prohibitive amount of pressure on his life total. And then he just played a first turn Burning Inquiry. TLDR: I discarded three lands. My hand went from “very good” to “completely unplayable” in one Red mana. I mean when that card says “at random” it means it. This card is not only an extraordinary enabler for the most explosive Hollow One draws, it is a dizzying, if unpredictable form of disruption; one of the few ways you can still manascrew the opponent in this post-Stone Rain world. This one might not make sense to you; it certainly hasn’t started to make sense to my opponents, and it’s been close to nine years now. Searing Blaze has two targets. A common play pattern will be for you to send a Searing Blaze at a Stoneforge Mystic (Legacy) or Snapcaster Mage (Legacy or Modern). In response, the hapless White mage will respond with Swords to Plowshares (Legacy) or Path to Exile (largely Modern). You won’t be able to stop him gaining life, or searching through his library, but he will not have gotten what he wanted. You see, these poor unfortunate souls are trying to avoid the face damage. In Magic, if all the targets of a spell or effect are removed, that spell or effect is countered. If this were Searing Blood they would be getting what they wanted. But Searing Blaze has two targets. So not only are they discarding a useful card (their Path or Plow), and still losing their creature . . . They don’t avoid the face burn! I can happily say that one of the last four points of damage I needed to make Top 8 yesterday was on a non-kicked Searing Blaze, aimed at a Snapcaster Mage during my upkeep with Rift Bolt on the stack. He did, however, get to find basic Island number whatever before that suspended sorcery resolved. 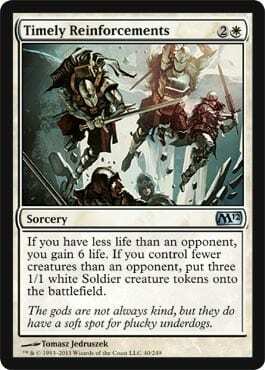 HOW IS THIS A REASONABLE MAGIC: THE GATHERING CARD? Or, at least, a reasonable one to play main deck? In Round Six of Swiss I got stuck on one land both games against my opponent. Neither game looked close at any point despite essentially perfect Terminus draws from the other side of the table; and even an appearance by hated Lyra Dawnbringer. Conversely, in Top 8, on the play, I basically got destroyed by multiple main deck Timely Reinforcements. As in, “not one”. Timely Reinforcements was obviously a great call for the tournament I happened to be playing in; the option of playing multiple copies harkens back to the matchup comment I made in Persistence Pays. This is a matchup that can really go either way based on the customization. Cards like Opt and Serum Visions can increase the likelihood that will get key hoser cards. That both encourages them to play a lot of 1 mana manipulation and encourages them to play such cards, even singletons. 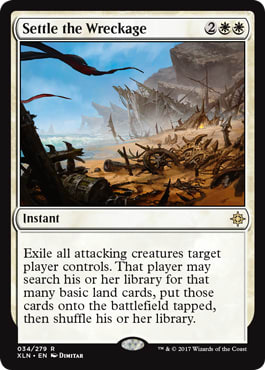 Opt, for example, seems tailor made for casting Terminus during the opponent’s attack; and playing a ton of 1 mana search cards helps you get to your hosers fast enough that they matter . . . Even if it isn’t on turn two or three. The onus is on the player to at least run certain numbers of these. In this strategy, one Rest in Peace, one Stony Silence, and so forth are much higher impact than two or three copies in most other non-Blue decks. The presence of multiple Timely Reinforcements, though? In a multiple Opt deck? Can I get a barf emoji? Horrible in the mirror, versus Grixis, etc. B A R F. E M O J I.
Astute fans of the tournament game may have raised an eyebrow this weekend seeing multiple copies of Riders of Gavony make Top 4 -- on multiple teams -- up in Detroit Rock City. Though none made Top 4 this weekend, an equally four-mana-tacular (and odd) choice may be Whirler Rogue. Both cards are Human; neither has a particularly efficient power-to-casting-cost ratio; although Whirler Rogue is essentially 4/4 for 4 mana . . . Just across three bodies. Both of these cards do something particular; and accomplish that task relatively well. 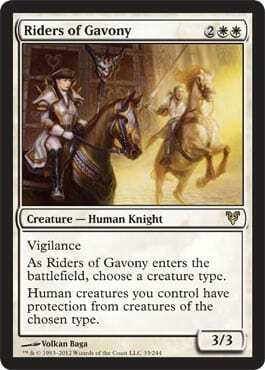 For Riders of Gavony, you’ll typically name “Human” and get a large advantage in the mirror match. Your opponent will be essentially incapable of attacking, as all your guys will have protection from all of their guys. At the same time, you will be able to Alpha Strike at will, because none of their guys will be able to block. Whirler Rogue is less obviously gaudy. With this card, you can push through with, say, a giant Champion of the Parish, but will also have non-human creatures you can use to go wide defensively. Whirler Rogue might be the nastier instant speed play… But I think the jig is up once you’re ticking your Vial up to four in either case. Lyra Dawnbringer is bad. You shouldn’t generally play it in Modern. I told a player that yesterday and he laughed. Of course I would say that. I wouldn’t want to face it. But no, it’s bad. Not bad as in “this isn’t a good card” bad in the “this card is worse than other options and you are spewing value by playing it way. Barf emoji. I suppose you could play three or more 5-drop Angels but I haven’t seen that since the days of Brian Kibler in Naya. I would tend to think it’s still wrong to play Lyra Dawnbringer but I haven’t put a huge amount of thought into a world of three or more copies. If you’re in the first camp: You only want to play one . . . IT SHOULD BE A BANESLAYER ANGEL. Lyra Dawnbringer has the disadvantage of being Legendary. That doesn’t matter if you only have one copy. It has the additional upside of +1/+1 to other Angels. Again that doesn’t matter if you only have one. We can therefore say that it has no incremental advantage or disadvantage. Baneslayer Angel is identical on casting cost size, and base capabilities. Both cards are 5/5 with flying, first strike, and lifelink. Where Lyra Dawnbringer has “nothing” Baneslayer Angel has Protection from Demons and Dragons. People play Demons and certainly Dragons! A literal DRAGON DECK won a Classic one month ago. Actually WON. It played ten main deck Dragons before you consider Sarkhan, Fireblood’s Ultimate. Of those ten Dragons, two have Protection from White. It’s hard to exaggerate how much more relevant Protection from Dragons is than “nothing”. If you play two copies, please don’t play two copies of Lyra Dawnbringer. The first one is mathematically worse than the first Baneslayer Angel and the second one is a disaster. YOU CAN’T CAST IT. IT IS A LEGEND. I think there is a small upside possible on playing 1 + 1, but that only works out when you have both Angels actually in play. A single Baneslayer Angel is never worse than a single Lyra Dawnbringer. I guess it’s okay to play 1 + 1 rather than two Baneslayers; it’s unclear whether you’re more or less likely to have both Angels actually in play than be paired against a deck with Demons and / or Dragons. I think I would err on double Baneslayer Angel, though, as I’m more a “control the risk” mathematician than the “see how high we can roll this die” kind. Don’t get me wrong: Still dies to Doom Blade. My one loss in the Swiss was against a ca-razy deck I hadn’t seen before. 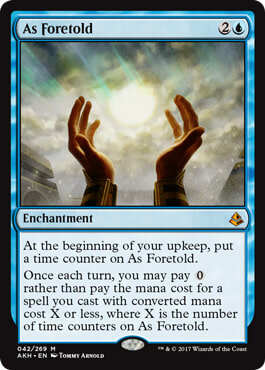 It played a ton of Suspend cards like Greater Gargadon, Ancestral Vision, and Restore Balance. The deck was actually quite awesome and I don’t know how a non-dedicated Control deck can plausibly beat it once it gets its engine going. He beat Grixis in the Swiss but lost to Tron from the 1-8 matchup in Top 8 so what do I know? Maybe this REALLY makes no sense to YT! There are a couple of things going on with this deck that break the normal rules of Magic. One of them is the ability to stow away cards via Suspend so that they aren’t anywhere you can usually discard or destroy. This combined with the fact that Planeswalkers weren’t a card type when the original Balance was printed makes for profound symmetry-breaking with Restore Balance. It is in fact the case that I didn’t “get” it the first time around. I made a small mistake that wasn’t material in the match we played, but was still a mistake. When my opponent sacrificed all of his lands to Greater Gargadon and then cast Restore Balance with As Foretold I had the option of breaking a Wooded Foothills to cast the Lightning Bolt in my hand. I elected not to break the Foothills in order to leave a mana producing land in my deck. This was incorrect as I forgot the other broken text on Balance, which meant I had to discard two cards. Had I activated the Foothills, I would have not only gotten three damage in, but I would also have only had to discard one card. He won by such a huge margin it didn’t matter, but . . . It mattered. I wonder how sustainable this strategy might be. It is nearly impossible to interact with a lot of their action. Tolaria West for Ancestral Vision or Restore Balance is a Tutor you can’t counter. Stowing cards away with Suspend not only protects them from hand destruction, it lets this Blue deck cast them with a ton of mana open at some future time; most importantly it breaks the symmetry of Restore Balance, which is already so lopsided in a nearly creatureless deck. On the other hand, the rise of these decks has me wondering . . . A single well-placed Path to Exile or even Remand can be big problems. Small procedural point: When you’re playing against a deck with Timely Reinforcements, it probably pays to change your land prioritization. Fetch aggressively for untapped Shocklands. This can help to mitigate the timing on an early Timely, but more importantly, there will be long game pressure on your basics. I played three Mountains on Sunday. This is probably more basic land than the average Burn deck, and on the high side for most fetchland-reliant decks in Modern. Many decks are going to push your card advantage on basics with not only four Path to Exile but multiple Settle the Wreckage. You’re going to run out eventually, but you don’t need to accelerate that end point. Worse, decks with Crucible of Worlds have an even more dangerous long game capability. Field of Ruin is probably a nice place to start. They can Field your good lands and put pressure on your basics the same way they would with Path to Exile and Settle the Wreckage . . . And then the Ghost Quarters start coming out. I saw a player annihilate a opponent, eventually hitting his basic Islands with Ghost Quarter after Ghost Quarter. You can plausibly Strip Mine lock an opponent with Ghost Quarter + Crucible of Worlds + time. Awesome, right? I don’t love the matchup v. Tron, but this ability to slow down and then push the envelope is worthy of respect. On that note . . .
As a player, have you ever thought about siding in Stony Silence against Tron? It’s not something I’ve ever considered as a Burn player, but maybe I was wrong. Stony Silence is a haymaker against KCI and very good against Affinity, but I just never thought I’d want to spend two early game mana on it in a favorable Tron matchup. Not only does Stony Silence stop every Expedition Map in its tracks, it turns off Oblivion Stone also. You know, one of the main ways Tron might destroy the offending enchantment. While not a game winner per se, it can not only slow down the big mana development, depending on your sequencing, it can cut off operating Green mana for cards as simple as Ancient Stirrings. I might as well note my own sideboarding for this one. I didn’t change a single main deck card from my last several big tournaments, but I did cut off the fourth Chained the Rocks and add weirdos like Kataki, War's Wage; Zo-Zu the Punisher; and Sudden Shock. 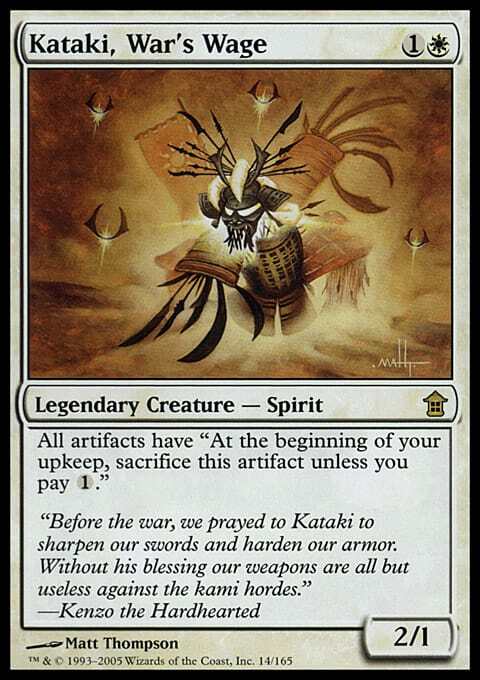 Kataki was my catch-all for any Affinity deck, KCI, and even Humans. Kataki is better than everything but Shattering Spree against Affinity; better even than you might be imagining right now. One thing I did before the tournament was to check a ruling with the Head Judge. Kataki actually grants each artifact the ability. It’s not “your” ability even though it’s your Kataki. 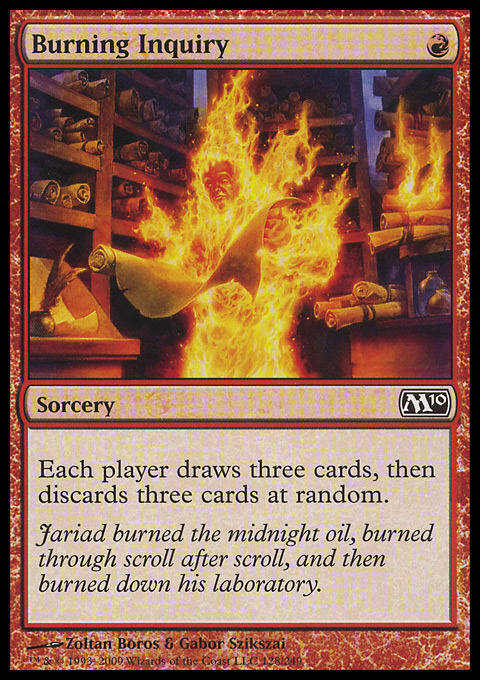 That means if an opponent -- unfamiliar with this card as I was unfamiliar with Restore Balance -- moves to draw step, the presumption is that he meant to sacrifice all his un-paid-for artifacts. Kataki is therefore very compelling against cards like Darksteel Citadel and Mox Opal; though different than cards we usually like, like Smash to Smithereens and Shattering Spree. Stony Silence is stronger by far against KCI, but Kataki still has some text. His advantage is not only against Affinity early, but taxing on Affinity late (when you might otherwise have to deal with a very wide Hangarback Walker). I sided Kataki in against Humans and it did exactly what I wanted. If you can tax the Aether Vial, that is basically the same as countering the utility of the Aether Vial. If you can steal 1-2 mana and get a clean trade with any body, that’s just fine. Humans is a matchup where if it goes long, Burn basically always wins. You pin all their creatures or lock them down with Grim Lavamancer, and win with “something”. Kataki counts as something in my book. Any body is fine there. I wanted another card that could come in against but that was also utility relative to face-burn for matchups like Infect. I settled on one Sudden Shock. Two points on this: As I predicted, one Infect deck made Top 8. I also killed my Top 8 opponent (in the one game I won) with a Sudden Shock for exactly two when I had no other cards in hand. I could easily have lost the game if it was any other card. Sudden Shock is both much worse than Exquisite Firecraft and much more versatile. Doing half as much damage is terrible; but Exquisite Firecraft can be undone with more life gain. Sudden Shock just kills them, dead. Again, it’s one of the best cards you can possibly play against Infect, basically guaranteeing a two-for-one or better + the removal of their all-in threat. The last weirdo card, again for , was Zo-Zu, the Punisher. He was never the haymaker I wanted him to be; but he always forced the opponent to Path or Wrath him before they continued developing. I think it’s okay to side in a 3 mana creature in a matchup where the opponent will be liberal with Path to Exile. His expected value is enormous if you land him on turn three. I mean one Flooded Strand is worth 4 (FOUR!) points, and that’s not even counting one attack. I’d consider playing two. Usually against I side out Searing Blaze, but I left all four in in the Top 8 match I lost. I played next to my opponent the previous round, and saw that he left in not only Snapcaster Mage but sided in Spell Queller. I also knew he had at least one Lyra Dawnbringer, so I wanted a little more burn that could gang up on a first striker. It’s neither right nor wrong to work your sideboarding out like this. Searing Blaze is probably the weakest card against in the dark. It costs two, and often has no target. You can’t peel it in topdeck mode and just kill them. But if you know that they’re not only leaving in a 2/1 creature but siding up more potential targets, you kind of have to aim at them. One thing I might have done wrong was to side out all my Boros Charms and two Rift Bolts. Most of the cards in the Burn deck do about the same thing, and Rift Bolt is the clunkiest. What I think I should have done was to side out some Lightning Helixes or the other two Rift Bolts and leave in at least two Boros Charms. As I’ve written previously, Boros Burn is cleanly ahead in most matchups in Modern; to a ridiculous extent in some cases. But the matchup is very up in the air. In this case I think, in hindsight, that adding volatility might be valuable. Like, Boros Charm is much worse some times. But if they’re planning to get your Eidolon with Supreme Verdict, it suddenly becomes your best friend. I think next time I’d play for some of that volatility, instead of trying to control as many variables . . . Into the L column.